Yeah, yeah. Harry has been following me around for the last few days, poking me with his swagger stick to remind me that I haven't posted a blog entry in weeks. Because his swagger stitck is an exquisitely sharp quilting needle equipped with a customized leather handle, being poked with it gets the point across (Ouch! Bad Pun!). 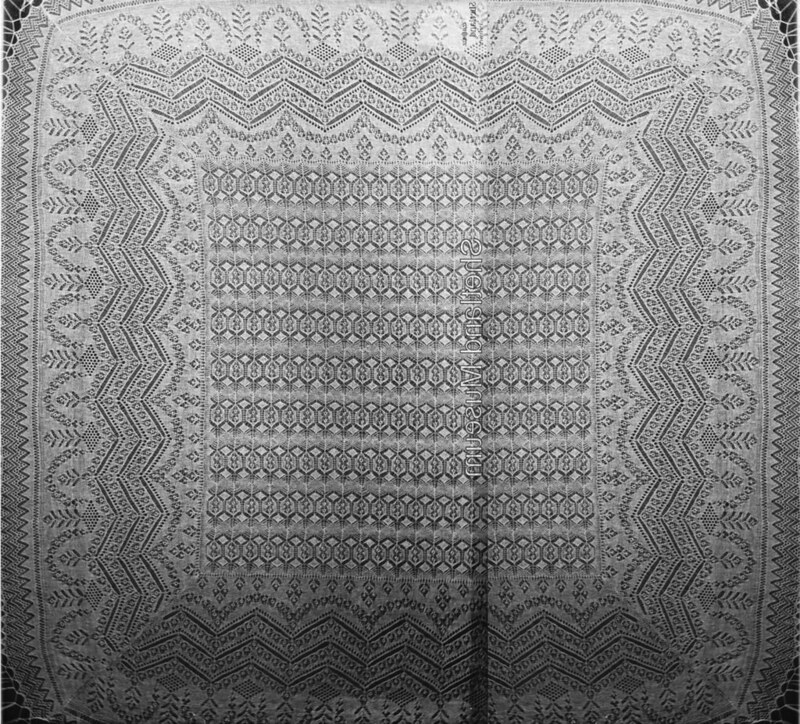 Most of my time for the last few weeks has been sucked up into a fascinating collaborative project called The Queen Susan Shawl (based on a photograph by M. Sutherland, from The Shetland Museum Photographic Archive). The project is remarkable in so many ways. It shows, first of all, the power of a social networking site such as Ravelry, to foster communication across the entire globe. The shawl is so lovely and so complicated, but by combining all of our skills, The Ravelry Heirloom Knitting Forum has re-created the pattern for this masterpiece. Right now, the only missing bits are the corner chart and a paragraph or two of calculations. We are hoping that by the New Year, The Queen Susan shawl pattern will be available on Ravelry, free to anyone who wants to hoard, knit, or just cherish this delightful design. Because I have been working like a little fiend on all aspects of the shawl, I am not going to recapitulate the history. Instead, I am posting, with my own permission (seeing as how I wrote it), the introduction to the pattern booklet. It's a lovely story, so please enjoy! 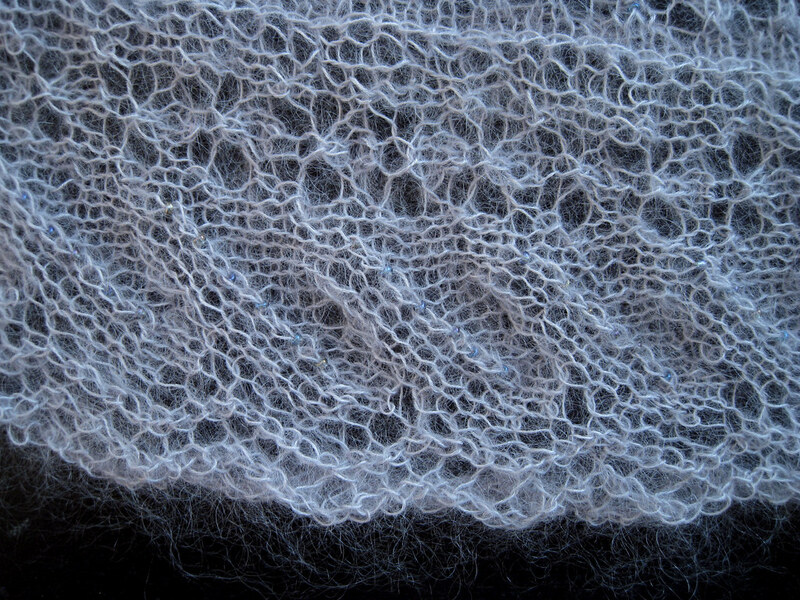 Clarabeasty: Does anyone recognize the border pattern on this piece of lace? Specifically the part that looks like little wreaths and twigs. Sophiphi137: No, but it is beautiful! I also am now very curious about it. M1K1: Look again in the Shetland Museum photo library. There is a close up detail of another shawl which has the scalloped (wreath) effect made by placing roses. You can get a really good look at it by selecting Large Image. Isn’t it a fabulous effect - softening the straight lines of the zigzags. fleegle: Wow! That’s the most beautiful border I’ve ever seen…..gets out graph paper immediately…. This innocent, offhand exchange would result in a mammoth project involving more than 30 people and hundreds of hours of charting, swatching, proofing, writing, editing, and layout. We started off rather simply with the center design, which we recognized from other shawls. The pattern, called Spider Webs, Spiders, and Diamonds, was easy to chart from other sources. 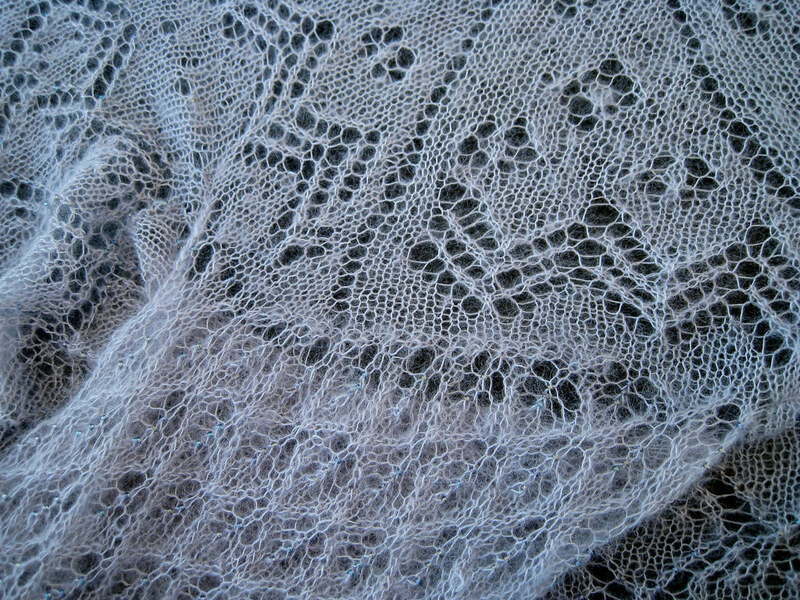 But then, Msleoknits, presented an alternative center that she had charted and used for another shawl. Her design eliminated the garter stitch interruption in the spider webs, and many of us preferred her design to the original one. Similarly, Q-Knitter graphed the original edging. a variation of Mrs. Sutherland's Fine Lace, a coincidence that made us all smile with delight. 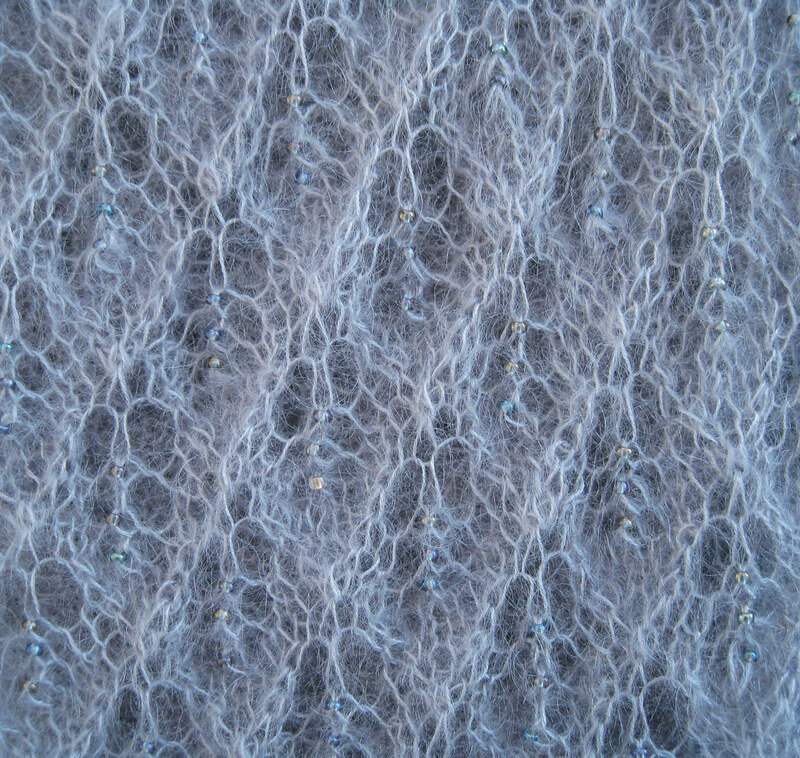 EdithCone subsequently presented a second, more delicate pattern—a variation of Alpine Lace—and made a chart for it, as well. Now we had charts for two centers and two edgings, and the project was not so simple anymore. The border, clearly the charm point of the shawl, presented numerous problems. First of all, the original shawl was clearly knitted in the traditional manner. The center and borders were worked separately and sewn together. We all decided that we wanted to knit the piece in the modern way, that is, knitting the center, then picking up the border stitches and knitting the rest of the shawl in the round. And this method meant that we had to invert all the motifs in the border. Piece by piece, each motif was charted and test-knitted. In many cases, we had to choose among several alternatives. After a few weeks of experimentation and decisions, we had a semblance of a genuine, workable border chart. The corners presented more difficult decisions. While we liked the original corners, we wanted something special. KnitLab became our Guy in the Corner, working up the beautiful flower sprays that integrate so well with the main border area. In what can only be called an astounding feat of charting, M1K1 not only charted the complex corner, but turned part of it inside out so less-experienced knitters could better see how the pattern fit together. fleegle: Not terribly radical. Although you would have to regraph the entire corner. fleegle climbs into her nuclear blast bomb shelter and closes the hatch. Click. larascreations: Well…….it does seem like it might look nicer with another 1-2 between? laceknitterlois: “NOOOOOOOOO”….flipper proofer runs & throws supercape over m1k1’s computer screen. Leaves scene whistling. Just keeping the world safe, one knitter at a time. As you might expect, the concept of an additional row was tabled forever, amidst heartfelt apologies entailing considerable virtual groveling. Gentle humor and mild tangents that drifted into totally unrelated topics made all of us smile amidst our piles of graph paper. In the meantime, we realized that we needed to think about how we were going to present the finished pattern, and we needed to bring the Shetland Museum into the loop. The consensus was that the pattern should be placed into Creative Commons without copyright protection, and should be available as a free download on Ravelry, a highly popular site for knitters. But we wanted to alert the Shetland Museum to the work and give them the files, so visitors to their web site could download the pattern from there, as well. Perhaps the museum would be able to use the pattern as a donation magnet. Here is the original letter written by edithcone to the Shetland Museum. I’m writing to you on behalf of a group of knitters who were very inspired by one of the shawls in the Shetland Museum and Archives Photo Library. The shawl in question is found in the photos numbered S00019 and S00024. 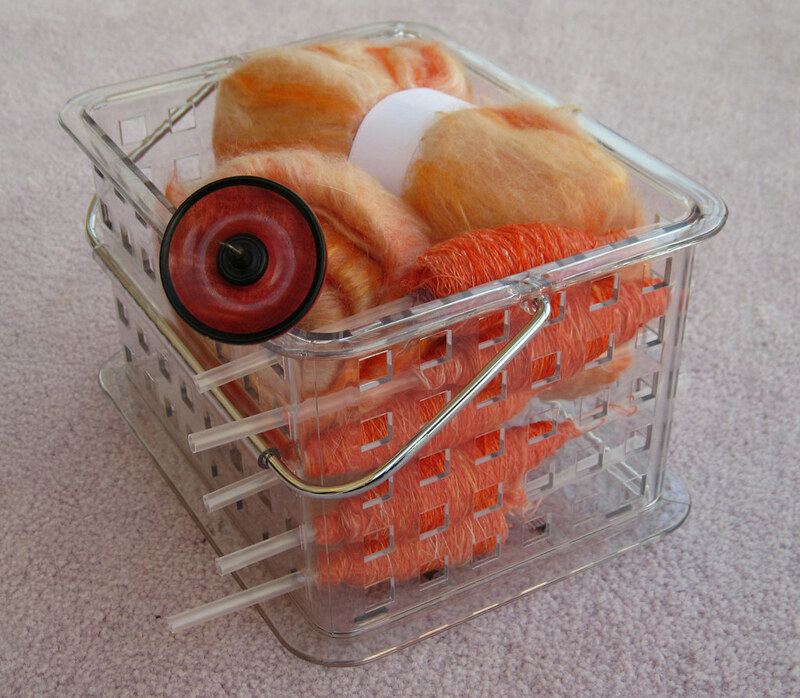 We are members of Ravelry, an online community of knitters and spinners from around the world. 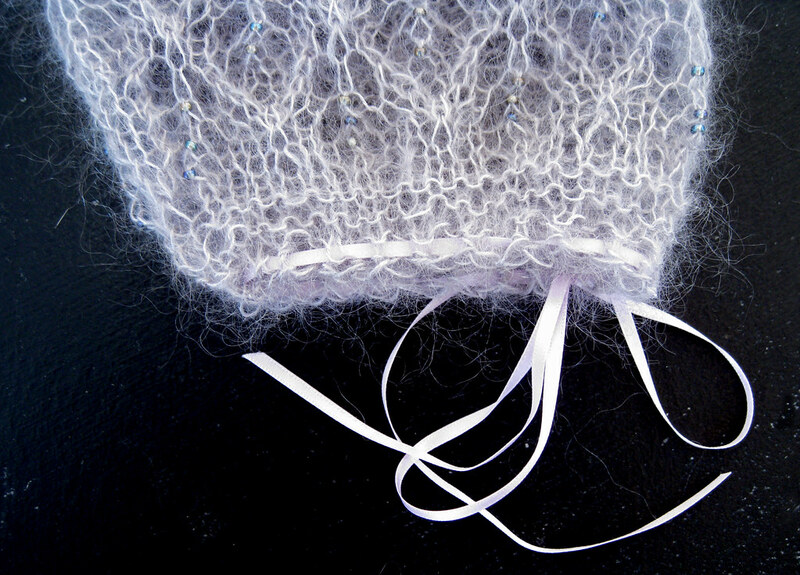 Within Ravelry, our group, Heirloom Knitting, is particularly interested in fine Shetland lace knitting. 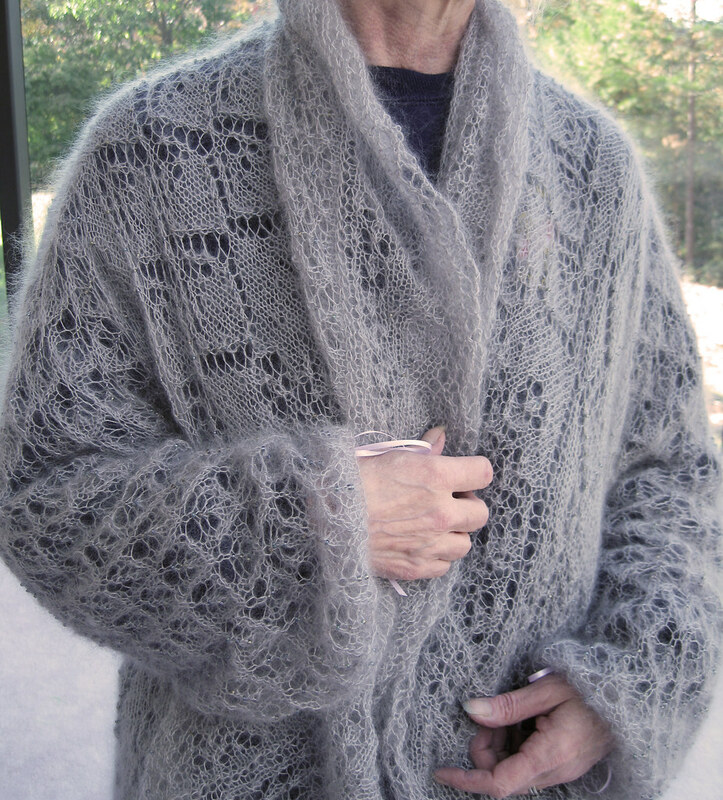 The shawl shown in the photos above, was brought to the attention of the group and the design was so well-liked it was proposed that a collaborative effort be made to create a chart of the original design and produce a pattern that could be downloaded free-of-charge from Ravelry. After much debate, the shawl was named The Queen Susan shawl. We would like to give mention to the Shetland Museum for housing the original photo which led to the project. We also thought you might be interested in being able to offer the pattern for download from the Shetland Museum site (thereby making it available to non-Ravelry members). Is it possible you have any background information about this shawl, such as the name of the knitter/designer, the approximate date it was made, the location, etc.? M. Sutherland is noted as the photographer. Was the shawl likely made by a member of his family? Any information you could give us about the shawl would be very helpful and appreciated. Because this is such a large project, it will be some time before any of us finish knitting an entire shawl. In light of this, we would be extremely grateful for the use of one of your photos (with credit given to the Shetland Museum), so that we can show a completed shawl in the pattern instructions. There has been a tremendous co-operative effort within the group and at this point, most of the elements of the shawl have been charted. There are few Shetland lace shawl patterns of this complexity available today and none, as far was we know, that have been produced by knitters from all over the globe. It is exciting to be involved in this project, one that we hope will make a beautiful Shetland shawl design available to knitters everywhere and help continue the tradition of Shetland lace knitting. I hope you will entertain our request to use one of the photos mentioned at the beginning of this letter. I look forward to your reply. Many thanks for your email. We were delighted and intrigued by how our photographic archive has been put to use once again. The photographer M. Sutherland was Magnus Sutherland, of Colvadale, Unst. He was related to a number of expert lace spinners and knitters, some of whom are pictured in photograph R01400. He took the photographs of the lace pieces in the late 1890s or 1900 – one scarf has the date 1899 knitted into it and it is likely that the other lace pieces were photographed at the same time. This shawl is not part of our collection. However, we have several other shawls and stoles knitted by the Sutherland women, one of which is on display. 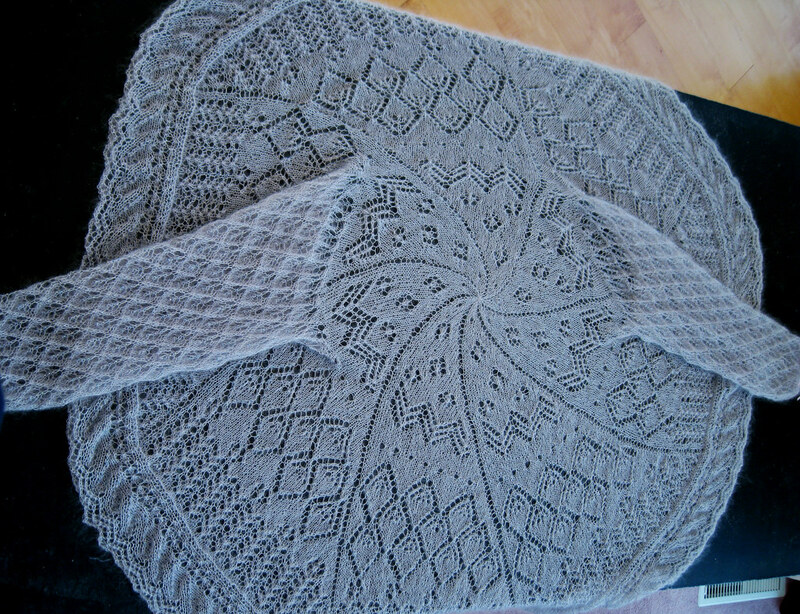 It has similar centre and border motifs to the one you are knitting. Our records indicate that the border of the shawl on display was designed by the brother of the Sutherland sisters, probably Magnus himself. It is possible, but by no means certain, that Magnus was involved in the design of the shawl you are knitting. The Sutherlands designed and traded patterns with one another, as you can see from Magnus’ photographs that many of the shawls bear similar motifs but used in different combinations. If the designs were written down by the Sutherlands, which is unlikely, this information has not passed to us. However, the reason we have these early photographs of Magnus’ is that they were passed on to Ethel Henry, who donated them to the Museum. Ethel Henry was herself an expert knitter and knitwear designer, working in both Fair Isle patterning and some lace – she designed wonderfully stylish fine lace jumpers in the 1950s! We have two of Ethel’s lace notebooks, one in which lace patterns are written out, in another where they are charted. Some of the motifs found in the Sutherland laces are described in these notebooks. Unfortunately, Ethel stipulated that the notebooks not be published, and therefore, we can only offer them as study materials here in Shetland. Have you completed the pattern for this complex shawl? If you are struggling with any parts of it, please let me know and I will see how I can help. I will meet with our IT person next week to discuss sending you the Magnus Sutherland photograph for the completed pattern and how to attach Ravelry information/download to the photographic archive website. I shall get back to you with this information in due course. Having received an enthusiastic response from the Shetland Museum, we continued the cycle of chart, knit, proof, write, edit, chart, proof for several months. Until finally, we had all the material at hand, and this pattern booklet could be assembled for what we hope is your visual and knitterly delight. It was decided to name the shawl The Queen Susan, because several of the ringleaders bear that name or have close relatives who do. We also felt that the name conferred a certain dignity on this lovely piece. And finally, although fleegle wrote the introduction, EdithCone pointed out that she barely mentioned her own contributions. So, I will lapse into the first-person at this point and say that I was the initial instigator; graphed the original center and border; assigned the test knitting; wrote the bulk of the text; designed and laid out this pattern booklet; and generally pushed, poked, and prodded the participants where necessary to get the pattern assembled in a timely manner. I was the hub around which activity whirled, but without the other contributors, the project would never have come to fruition. The Ravelry Heirloom Knitting Group now presents to you The Queen Susan Shetland Shawl, and hopes that you will derive as much pleasure in working it as we did in developing the pattern. I’m feeling a little weepy here. Think of it - a piece knitted before the turn of the last century, designed by a close group of family/friends living in an isolated area, preserved in a photograph, being recreated by a far-flung band brought together by technology and a love of this craft. The Amazing (and Cheap) Spinning Notion--Zia! I don't often write about tools, because there's really not much new under the sun. Let's face it, a knitting needle is a knitting needle, and everyone has an opinion about composition, pointiness, and configuration. But they are still knitting needles, you know? However, no spindle spinner should be without a Zia. And wheel spinners might find her handy, as well. Let's take a little tour. First of all, Zia holds your spinning projects. The units are stackable, and come in a variety of colors. I like the clear ones so I can easily see what's inside. If you don't want your project open to the air, just place everything in a plastic bag before dropping it into Zia. She's got a handle so you can tote her around. 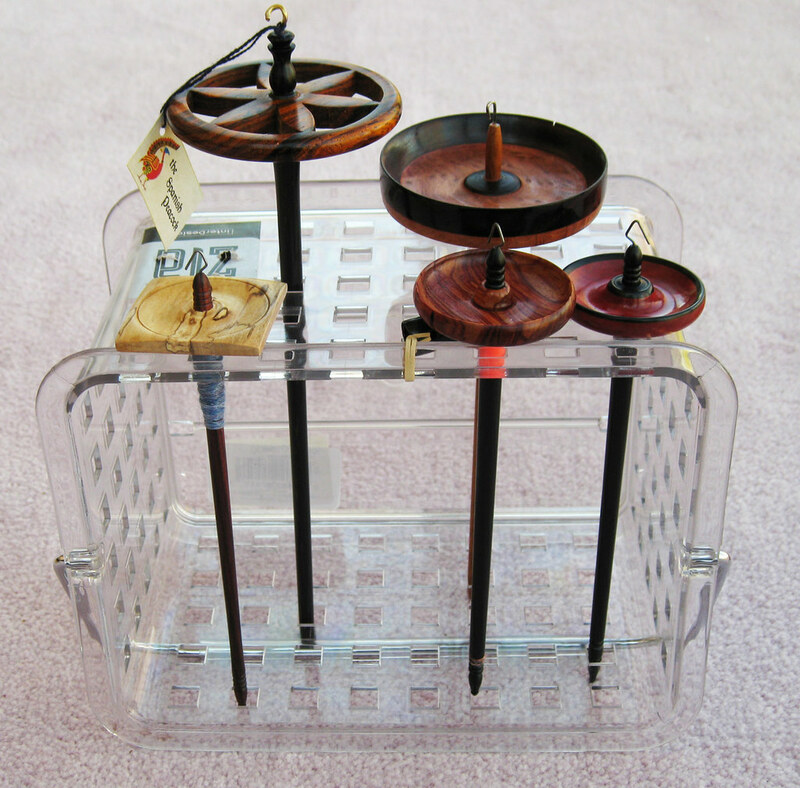 You can use a Zia to hold your spindles, too--just turn it on its side. Put a piece of foam down on the bottom if you like. The foam will prevent your spindles from slipping through the bottom holes. I don't have any foam in this picture, but you get the idea. 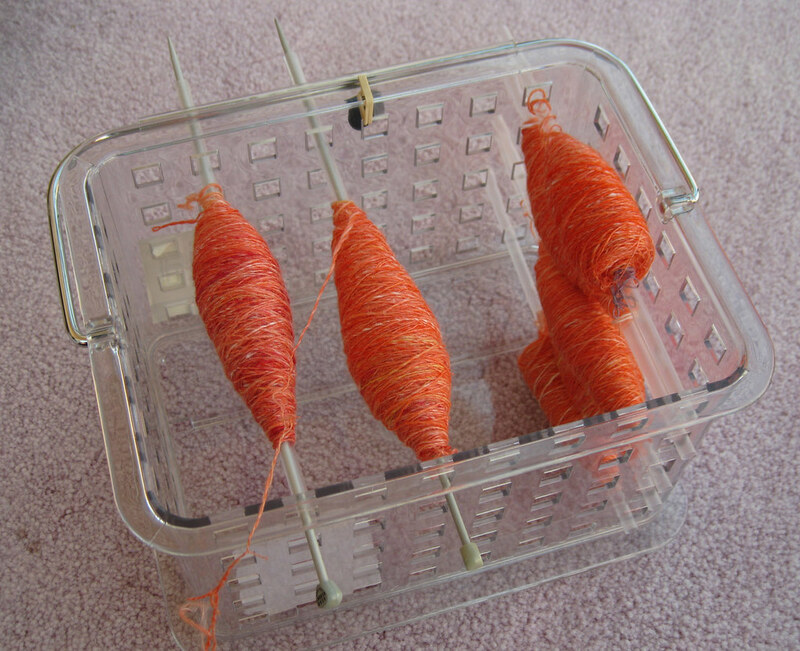 ...If you flip the handle to the other side, it keeps the needles from sliding and also adds a bit of tension. If you need more tension, make sure the handle is on top of both the straw and the needle. You can slip a bit of eraser or non-slip pads through the points and snug them up to Zia's side to eliminate any unwanted slippage. Best of all, Zia is not expensive! I bought mine at the Container Store, but they are also available on-line from Ace Hardware. Amazon, Organize, and many other suppliers. The one in the picture is the smallest size. Go shopping! It's a Sweater! It's a Shawl! It's Honeysuckle! Although I love to knit shawls, I do not love to wear them. The sole exception is my tiny Hyrna, which slips neatly into my purse for A/C protection during the summer months. As for the rest of them, I take them out for show-and-tell when somebody asks. Otherwise, they sit around in a drawer, playing cards, drinking beer, and watching PBS's Knit and Crochet Today on an iPod Harry installed for them. The Honeysuckle sweater immediately caught my eye, because it combines the best of all possible worlds. I could knit some simple lace with my favorite luxurious Hamanaka mohair/silk and have an actual, wearable knitting object. This inspired pattern appears in Issue Six of the elegant British magazine, The Knitter, and was created by Sarah Hatton, Rowan's in-house designer. Of course, I changed the pattern a bit. 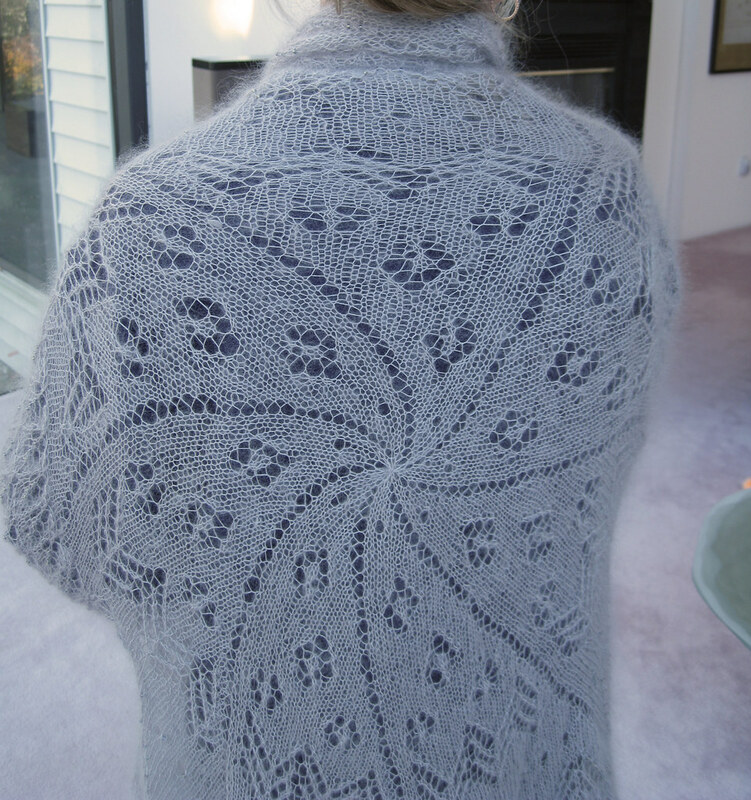 For starters, the original configuration is a circular shawl knitted flat and seamed. The sleeves also knitted flat and seamed, and then sewn into the bind-off/cast-on slits created for the armholes. Well, all that sewing seemed ridiculous, tedious, and annoying. 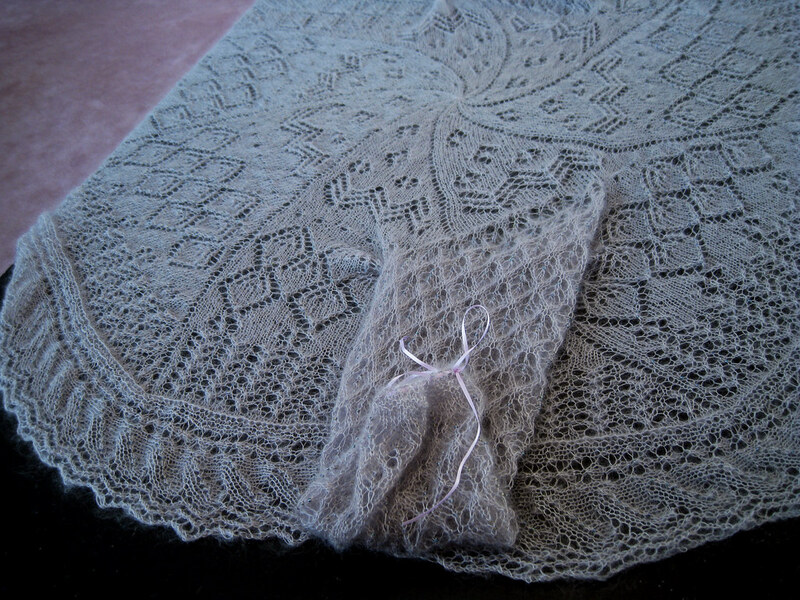 Instead, I knitted the shawl in the round, using a contrasting thread for afterthought armholes. 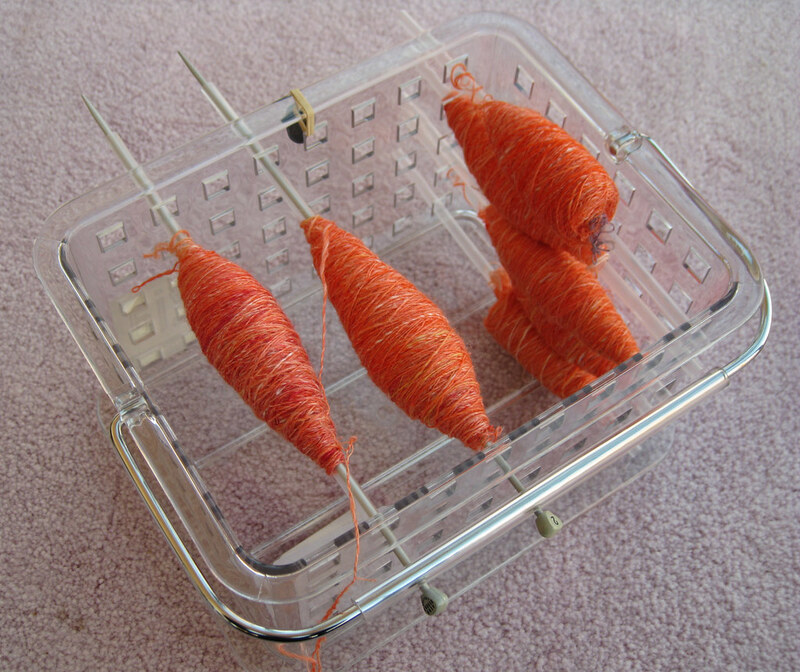 I then picked up the sleeve stitches around the contrasting thread and used Barbara Walker's clever short-row sleeve cap method to knit the sleeves downward. I also added beads to the sleeves and sweater front, and changed the boring edging to the more dynamic Ocean Wave from Miller's Heirloom Knitting. And, there was a lot of plain knitting in the original pattern; I dropped in a few Shetland cat's paws motifs to break up the monotony. The only mild setback was the cuff area. I have thin wrists, and even though I doubled the decreases at the end, the cuff was still too baggy for me. Instead of ripping out the mohair (urgh), I threaded some narrow ribbon through the final row and gathered the cuff. Best of all, Honesuckle informs me that she detests beer, can't play cards, and doesn't enjoy TV, so leaving her out of the drawer and actually wearing her pleases everyone. Well, except for Harry, who is always looking for another sucker for his rigged poker games.